For 25 years Portland, OR has been the home of the Oregon Brewers Festival, or “OBF.” The festival is one of the longest running craft beer festivals in the country, and also one of the favorites. I have attended the OBF for a few years and it just doesn’t get old! Drinking beers from all over the country, meeting people from all walks of life, and spending the weekend in one of the prettiest “big” cities I have ever been to; it doesn’t get much better than that. Held each year on Portland’s Waterfront Park, this four-day event hosts brewers from all parts of the U.S. and features live music, food, and even some souvenir vendors. 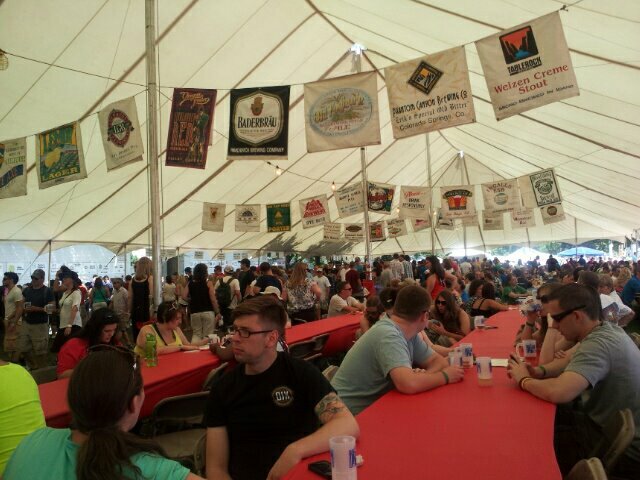 Large tents and long tables provide plenty of shade and mimics the beer fests held in Germany. Imagine, being surrounded by thousands of beer enthusiasts that want nothing more than to hang out and enjoy the newest creations that you can’t get every day! It’s great fun but now to the important part: the beer! So many beers, so little time! There were over 80 beers being served. I tried many of them but because I didn’t want to be hauled away in an ambulance, I could not try them all. So many of the beers I tried were incredible, but for the sake of time I will give you my top five favorites. #1) Double Dry Hopped Delta Pale Ale – Boundary Bay Brewing – Bellingham, WA (5.6%ABV, 45 IBU) – My favorite of the day! Boundary Bay uses and the newer Delta hop to create a lovely, spicy note. Munich and 2-Rows malts along with Northwest ale yeast give this pale ale a dry and crisp body with a nice citrus finish. Perfect for the hot day! #2) Kili Wit – Logsdon Farmhouse Ales – Hood River, OR (5.5%ABV, N/A IBU) – On a hot day there’s sometimes nothing better than a nice Wit beer. This traditional farmhouse ale if brewed with organic African coriander this tasty wit is rich with spice and clove. Malty, smooth body and rich, spicy finish. Good stuff. #3) Electric Beer – Electric Brewing – Bisbee, AZ (5%ABV, 35 IBU) – One of my favorite beer styles is German Kölsch. And Electric Brewing really impressed me with their version. Castle Cara 8, Castle Pils and Weyermann Pils malts create a full flavored, but light bodied beer. Notes of honey are present in the nose and taste and the finish is wonderfully spiced. I mean this in the best possible way; the flavor was reminiscent of Golden Grahams cereal. Another great summer beer! #4) Saison the Beach – Lompoc Brewing Co. – Portland, OR (5.5%ABV, 25IBU) – If you like sour fruit and spices, then this beer is for you! The aroma is floral and spicy. The body is peppery and spicy with a dry, sour fruit finish. Lompoc used a potpourri of ingredients to create this little beauty: Perle and Crystal hops, Pale, Weyermann Pils, wheat, biscuit and rye malts. They have outdone themselves. #5) Dirty Blonde – Paradise Creek Brewery – Pullman, WA (6.3%ABV, 22 IBU) – On a day as hot as the one on the day of the festival, this beer sure did hit the spot. Living up to its name, Dirty Blonde is a very well-balanced, medium-bodied beer. Spicy and malty with a touch of flowers. A little higher in alcohol, but quite refreshing. Kudos to all of the brewers for showing us how much fun can be had creating something a little different! And kudos to the organizers for making every festival as fun and safe as possible. I always have a great time at the brewers festival and will continue to attend every year until my taste buds dry up.